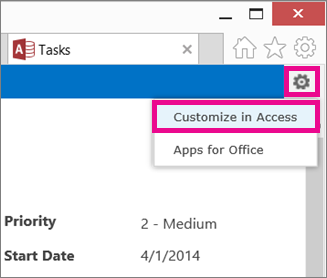 Although you add apps for Office to your Access web app from the browser, you need to open your web app in Access to remove or resize an app for Office. Removing an app for Office doesn’t delete any data from the Access web app. Only the display of the data is removed. Note: This article doesn't apply to Access desktop databases. Important: New name for apps for Office - Office Add-ins. We are currently updating our products, documentation, samples, and other resources to reflect the platform name change from "apps for Office and SharePoint" to "Office and SharePoint Add-ins". We made this change to better distinguish the extension platform from Office apps (applications). With your Access web app open in the browser, click Settings > Customize in Access. Click the table caption name in the Table Selector in the left pane, click the view where the app for Office appears, and then click Edit. Select the app for Office control, and press DELETE on your keyboard. Tip: If the view of your Access web app that you’re looking at contains more than one app for Office, you might have trouble figuring out which one you want to delete. Launch the web app in the browser and take note of the order that the apps for Office are in. They’ll appear in the same order within Access.